Biomechanical analysis of your running technique using state-of-the-art technology to help prevent injury and improve overall performance. Our facilities and equipment allow us to capture and measure the motion of your limbs, the forces you produce in your joints, and pressure mapping of your feet while you run. Using this information, in combination with muscle strength and range of motion measurements, we can provide feedback about your running technique that may help prevent injury and improve your overall performance. While the descriptions below are tailored to distance running, we are also happy to customize an analysis specific to your sport. In the past, this has been done for a range of athletes, from sprinters to pole vaulters to baseball players. The amount of detailed analysis we do will depend on your specific needs and budget. Assessing a person’s forces that they generate while running can help to give us an idea of the role that each muscle group in the legs is playing. For example, high forces at the knee joint when the foot contacts the ground could be a cause of knee injury, while high power at the hip during swing could be a cause of hamstring injuries. We can also use these analyses to look at asymmetries between legs and determine if one leg is compensating for the other. Using a state-of-the-art treadmill that measures contact forces between the person and ground in conjunction with a 3D motion capture system allows us to perform an accurate and comprehensive analysis of a runner’s gait. This analysis is packaged into an easy-to-read report that the runner can use for their own information or for coaches, trainers, doctors, and physical therapists to make corrective recommendations. 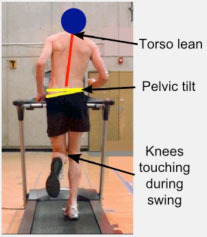 Measurement of the motion of the legs during running can help to determine specific imbalances, asymmetries, or compensations that could lead to injury or be the cause of underperformance. Using 3D motion capture technology, we are able to digitize a person’s motion during running and make quantitative analyses from it. Specifically, we look at the motion of the foot/ankle, knee, and hip complexes. These motion patterns are used to compare both legs to each other (Is the motion of each leg different?) and compare a person’s running gait to tens of thousands of other runners using a normative database (How does their motion compare to others?). Pressure insoles, which fit between a person’s foot and a shoe’s insole, provide snapshots of pressure across a runner’s foot while the foot is in contact with the ground. These devices are portable, and can be taken out of the clinic to a track or other running location for real-world testing. An analysis of pressure distribution can help to determine which part of the foot is being loaded while in contact with the ground, motion of the foot can be inferred through mapping the trajectory of the center of pressure, and asymmetries can be determined by comparing one foot to the other. The strength of the hip and ankle muscles during running are important for maintaining stability and propelling the body forward. Using a Biodex dynamometer, we are able to isolate specific muscle groups at certain lengths to measure their isometric torque output. These values can then be compared to other runners with the same body mass as well as between limbs to look for strength asymmetries. While our Quantitative Motion Analysis provides more numeric information about a runner’s gait, high speed video allows for a less expensive, portable alternative. By filming a person while running and performing functional tasks (such as stepping off a box) we can examine specific elements of running (like foot pronation and hip rotation) that may be the cause of injury or limiting performance. We can also take this system out of the clinic for measurement on a track or other running area. *All prices are subject to change. Our clinic also offers group rates of only 3 or more individuals and special University of Oregon internal pricing. For a quoted price specific to your situation, please inquire.